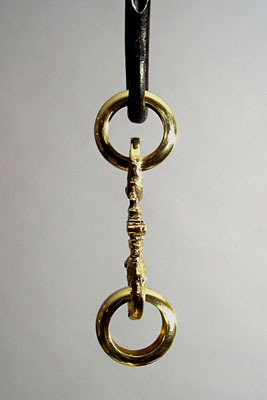 These Argand/Solar chain links are cast using an original link as a master. 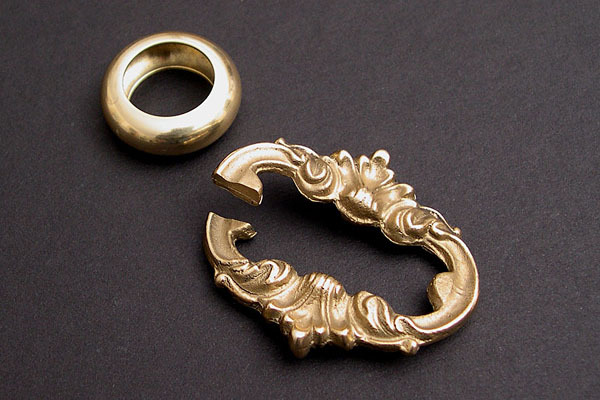 The cast links and machined rings are solid yellow brass. These are sold in sets that consist of one ring and one cast link. The overall length of one set is 2-3/16", 5 sets is 10-15/16", 10 is 21-7/8", and so on. The cast link measures 1-5/8" in length and 1-3/8" in width at the widest point. 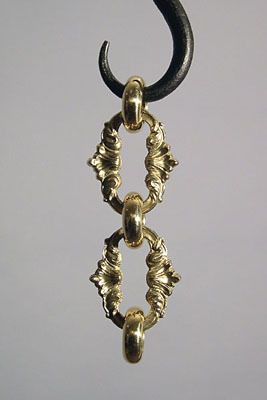 The ring measures 3/4" in diameter and 10/64" in width. One end of the link has a slit in it so that it can be opened wide enough so that the rings can be slipped on to it - see the last photograph. Orders can be placed for any number of sets. Note that the photographs show the rings buffed and the links highlighted; while they are very easily buffed and highlighted, they are not sold finished in this manner. Inquire for pricing if you require that they be furnished buffed and highlighted. 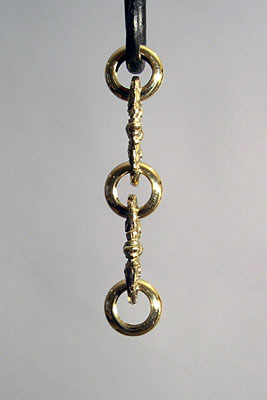 These Argand/Solar chain links are cast using an original link as a master. 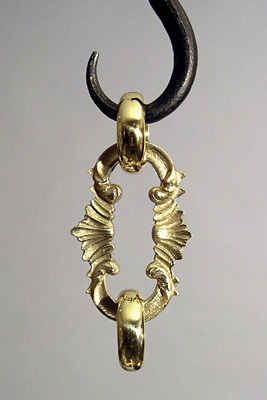 The cast links and machined rings are solid yellow brass. 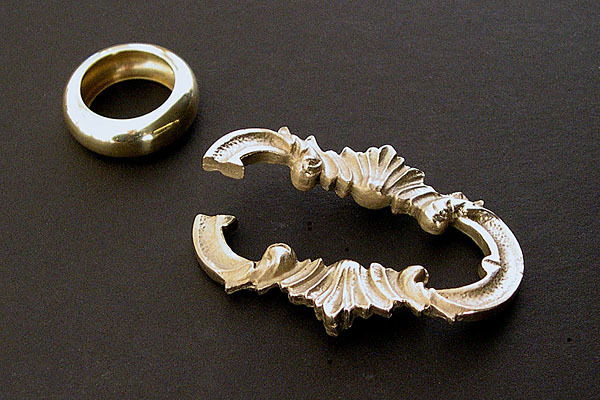 These are sold in sets that consist of one ring and one cast link. The overall length of one set is 3", 5 sets is 15", 10 sets is 30", and so on. The cast link measures 2-7/16" in length and 1-9/16" in width at the widest point. 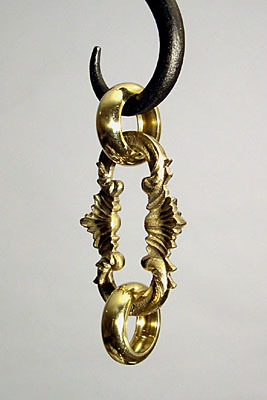 The ring measures 1-1/8" in diameter and 11/32" in width. One end of the link has a slit in it so that it can be opened wide enough so that the rings can be slipped on to it - see the last photograph. Orders can be placed for any number of sets. 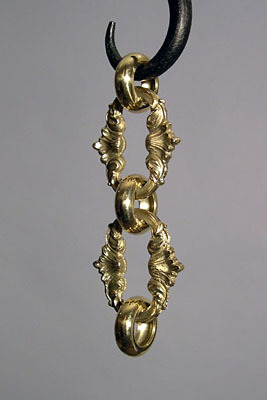 Note that photographs show the rings buffed and the links highlighted; while they are very easily buffed and highlighted, they are not sold finished in this manner. Inquire for pricing if you require that they be furnished buffed and highlighted.